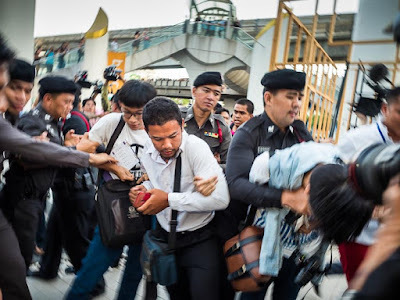 Thai police scuffle with protestors at a demonstration against the coup at the Bangkok Art and Culture Centre (BACC). Friday, May 22, was the one year anniversary of the coup that deposed the elected civilian government. Thailand's second coup in the 21st century. The Thai Army overthrew the elected civilian government on May 22, 2014. The coup came at a strange time in Thailand. The elected Prime Minister, Yingluck Shinawatra, had already been ousted by the courts (on corruption charges), but there was a "caretaker" government comprised of her political allies running the government. Suthep was still leading the anti-government protests, but it was a standoff. Suthep didn't have the power (either constitutionally or politically) to completely overthrow the government and the government didn't have the power (politically) to control Bangkok. A pro-democracy, anti-coup activist greets a police commander at the site of a planned protest on the anniversary of the coup. Protestors had planned to go to the criminal courts to file charges of treason against the military leadership who overthrew the government last year. Most of them were detained by police before they could leave the subway station near the courts building. The Thai army stepped into fill the void and seized power. Senior military officers now control all of the government ministries. The Prime Minister, General Prayuth Chan-o-cha, is the former army commander and leader of the coup. 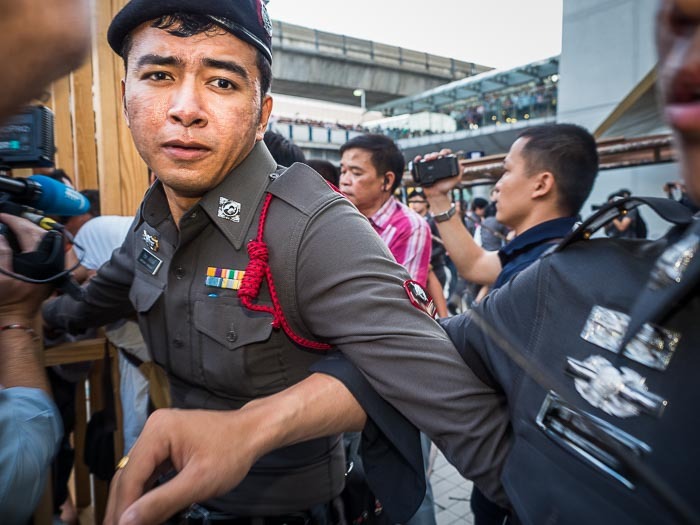 The first weeks after the coup were marked by large protests in Bangkok but little violence. The army gradually asserted control and rounded up nearly all of the members of the elected government. Hundreds of people were detained for short periods of time (weeks, not months) and subjected to what the junta calls "attitude adjustment." There were occasional protests against the coup, but nothing has threatened the dominance of the junta. 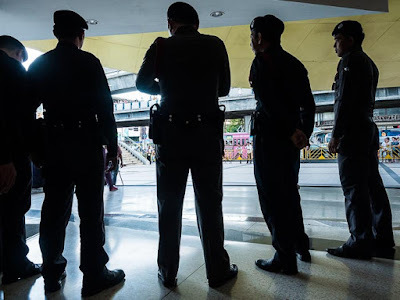 Thai police at BACC before the protest Friday night. The protests on the coup anniversary were the largest protests Thailand has seen since May of last year. That said, they were still small. There were four protestors at the subway station near the courts (and hundreds of journalists and security agents). There were small protests on some of the university campuses and some of the towns upcountry that have a strong "Red Shirt" presence. The biggest protest by far was at BACC, where there were perhaps 100 people (this in a city of 12 million). while police preparing to arrest protestors also lock arms. Police and protestors faced each other for several hours in a tense standoff. 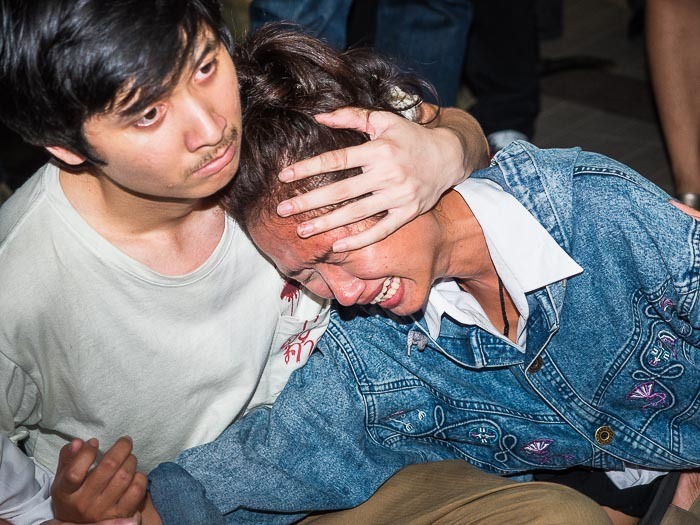 Protestors tried to occupy the sidewalk in front of BACC and police occasionally swept through the crowd, detaining people they had identified as protest leaders. There were some scuffles but no large scale violence, like we experienced during the Suthep led protests of 2013 and 2014. Protestors console each other after a police sweep through the crowd. There are more photos of yesterday's protests and scuffles in my archive or available from ZUMA Press.